Alignment is a very important service to provide the longest tire life and the best handling. Maintaining your car’s wheel alignment extends the life of your tires by helping reduce tread wear. Proper alignment increases driving enjoyment and safety as well as improves fuel economy. 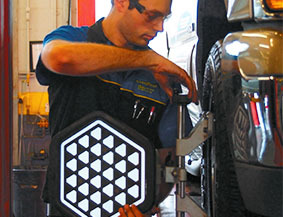 Raben Tire Alignment Technicians are trained and certified in this service and use state-of-the-art, computerized equipment. When should I have my alignment checked or serviced? During this service, the wheel angles are measured and corrected so that they’re set to vehicle manufacturer specifications for optimum tire wear and handling results.